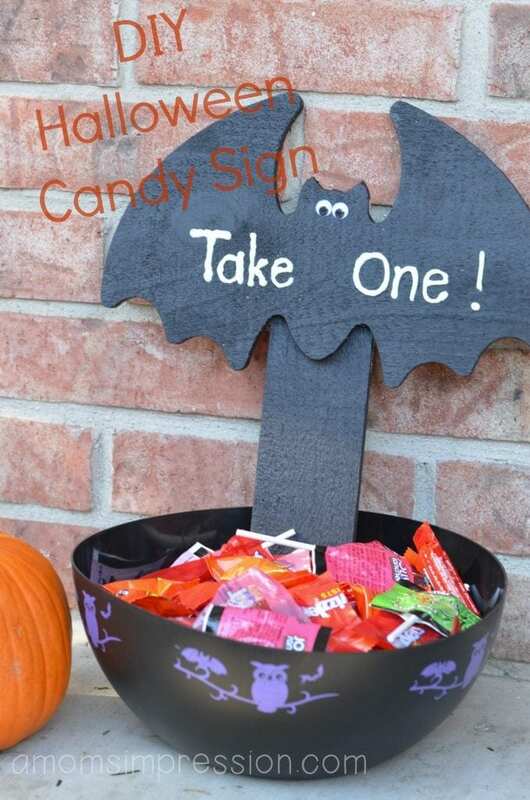 This Halloween Candy Sign is a perfect Halloween Craft for kids of just about any age. 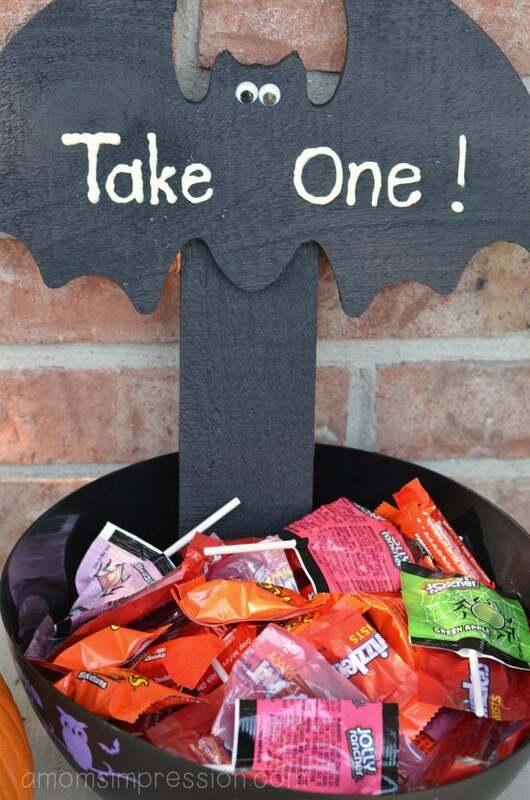 This is an easy, DIY glow in the dark candy sign to put on your front porch for trick or treaters. It was so much fun and a great idea if you are looking for easy Halloween Crafts for kids. If you are looking for more Halloween fun, check out my 31 Fun Halloween Kids Activities. 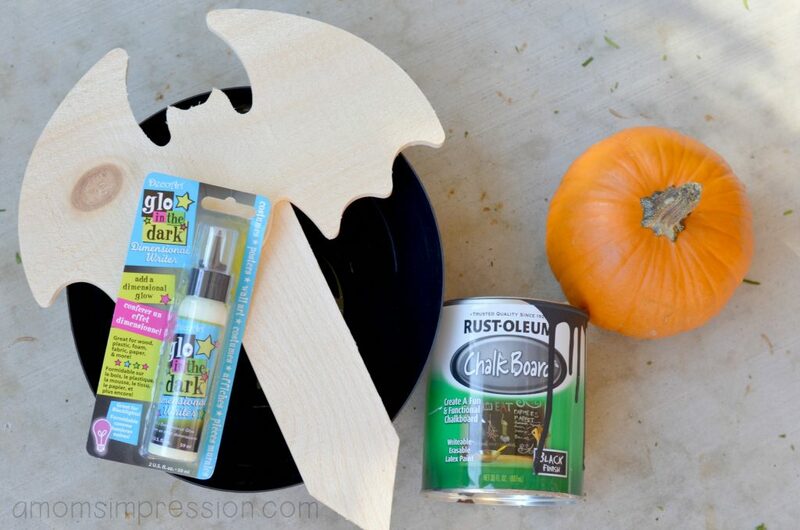 If you like this craft, I have tons more if you head to 20 Fun Halloween Crafts for Kids. Every year on Halloween my husband has had to work. He is able to join us late into the evening right before the kids head out to Trick or Treat. Because I am by myself on Halloween night with a very large dog (Eli), having trick or treaters come up and ring the doorbell isn’t the best idea. Eli would get excited and bark and try to open the door himself. To solve this problem I would set a bowl of candy out on the front porch and put out a “please take one sign”. This way, the kids won’t have to knock on the door and Eli won’t have to have a heart attack. This year I decided that I would get my craft on and make my own Halloween Candy Sign. Of course, to make it extra fun, I decided to make it a glow in the dark candy sign as well! This craft is pretty basic because I had found the wooden sign pre-cut for me. You can find these guys at your local craft store. I have also seen them in departments stores like Walmart. The key to this adorable sign is the chalkboard paint. This stuff is amazing. We originally bought it for our playroom and painted one of the doors with it to create a writable chalk surface. Since I had some left over I have used it for a lot of different crafts. Using this paint will allow you to write a message directly on the bat with a chalk marker so you can change your message anytime you would like! For this Halloween craft, I used puffy glow in the dark paint because I wanted it to glow during the night. But you can just use the chalk marker if you would like. 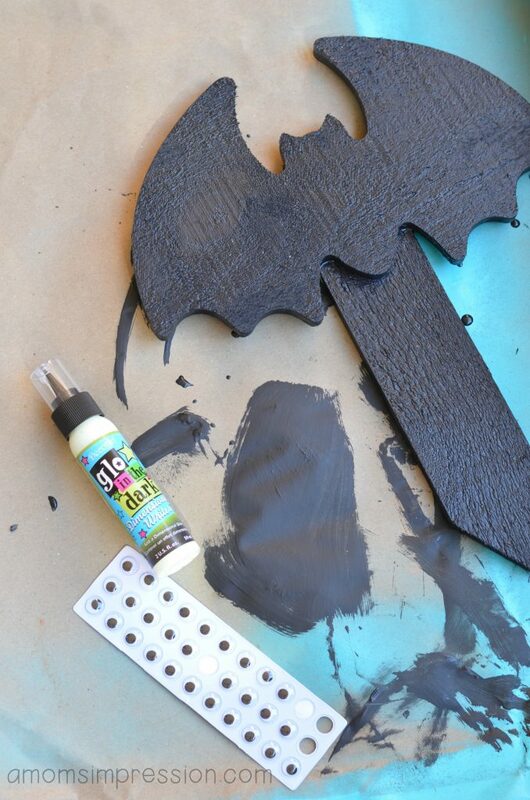 Simply paint the bat sign, add your googly eyes and a message. Next, fill a decorative holiday bowl with your favorite Hershey candy and stick your sign in. Now you are ready to set your dish out on your unattended front porch so trick-or-treaters can find it! With this Halloween glow in the dark candy sign, you too can enjoy a “bark free” Halloween! We have a lot of different Halloween activities we participate in as a family. When I was shopping at Walmart I found these large Hershey Candy Bags with a variety of candy in them that are perfect for all of our events. The variety in the bags is awesome because not everyone can enjoy a Reese’s. From favorites such as Kit Kat bars to Jolly Rancher suckers and more, I don’t feel like I am bringing the same thing to every event we go to. 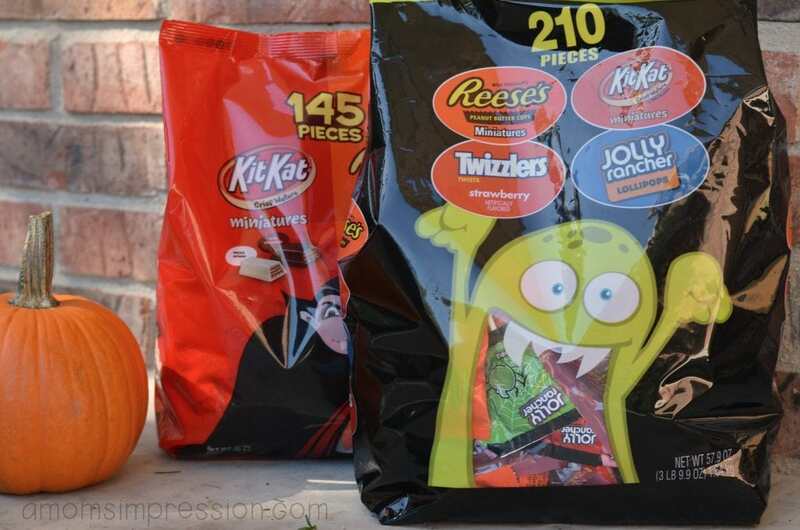 The large bag also ensure that we have enough candy for our large neighborhood. The kids around here love to trick-or-treat! 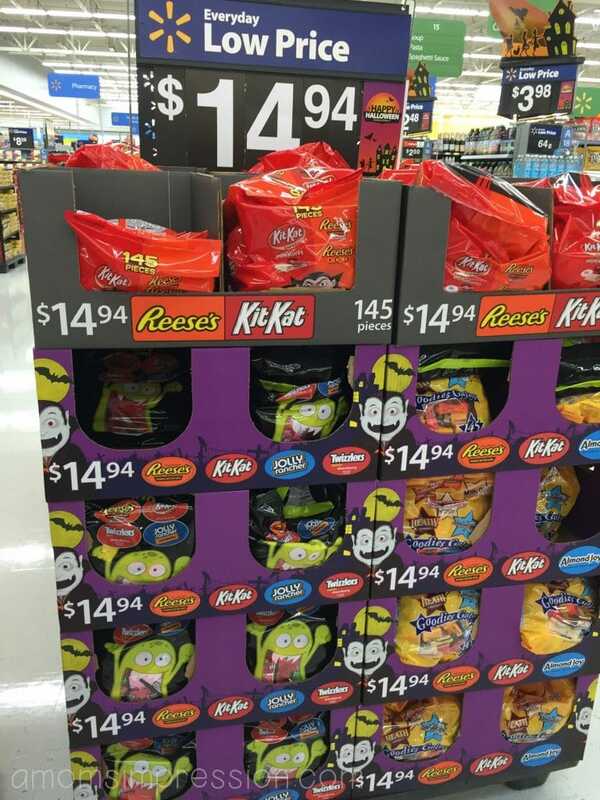 You can find the large Hershey candy bags on display at your local Walmart store. I found several displays in the candy aisle as well as the costume aisle to choose from. The possibilities with these large bags are endless so stock up!